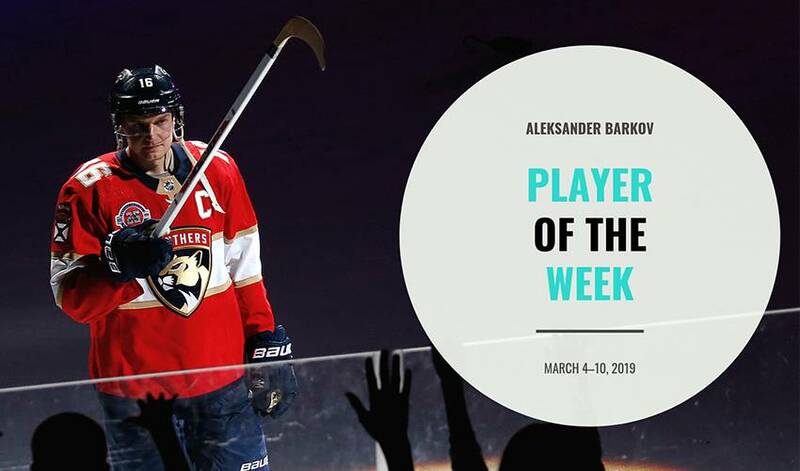 On pace for career-high scoring totals in his first year of captaincy for the Florida Panthers, Aleksander Barkov co-led league scoring this past week with nine points to match teammate Jonathan Huberdeau. Not only did Barkov set a franchise record in assists with five in one game Friday, he capped off his 400th NHL career game with his 30th goal of the season to extend his career-high total in the category. With 77 points so far in 2018-19, Barkov strengthened his hold as the team's scoring leader and sits just one tally behind Mike Hoffman for the team-lead in goals scored as well. Despite five shots on net and leading game forwards in ice time with 22:24 Tuesday against Pittsburgh, Barkov and the Panthers started their week by picking up a single point in a 3-2 overtime loss on the road. Thursday night, Florida lost their sixth straight with a hard-fought 4-3 defeat to the Boston Bruins, who used the win to extend their point streak to 18 games. The loss was the seventh straight decided by one goal. Striking early on the Panthers' powerplay for a 1-0 lead, the Finnish forward earned his 70th point of the season, becoming the third Panther in franchise history to post such seasons consecutively (Olli Jokinen, 2005-06, 2006-07 and 2007-08; Pavel Bure, 1999-00 and 2000-01). Barkov skated away with a multi-point game after later assisting on Huberdeau's first goal of the game, but the Bruins rallied to post the game-tying and go-ahead goal within 30 seconds of each other in the final frame. "We're 30 seconds away from a perfect 60-minute game, " Barkov said to reporters postgame. "They're a really good team on a really good roll. We came here and we wanted to end that point streak and get that win and move forward. Those last 30 seconds, they hurt a lot." The Panthers righted the ship, with Barkov at the helm, the very next night by completing the second half of a back-to-back in a 6-2 win in front of a home crowd. The Panthers captain set a franchise record, besting the previous record of four assists in a game (most recently accomplished by Thomas Vanek, March 14, 2017). "Coming here [BB&T Center], we had two choices," Barkov stated to reporters after the win. "Either forget about the last game and play as hard as we could this game, or just feel sorry about ourselves. I think we really played our butts off and deserved the win." Barkov earned the game's first star for his efforts, which gave him his 22nd point in his past 12 games. Skating in his 400th NHL career game, Barkov helped the Panthers to consecutive wins with his third straight multi-point night in a 6-1 win over the visiting Detroit Red Wings. No.16 netted his 30th goal and 47th assist while earning the game's first star for the second time in as many nights, all while leading team forwards in ice time with 19:24. Barkov wasn't the only Panther having a memorable game. Teammates Josh Brown and Dryden Hunt each scored their first NHL goals. Barkov also had kind words for Huberdeau, who co-led the week's scoring with nine points and goals with four. "[Huberdeau and I] just try to hold each accountable and try to bring the best out of each other," Barkov spoke not only to the pair's dominance, but his entire line. "We're playing with a really good player, too, [Evgenii] Dadonov. As a line, we try to push each other more and more every shift and try to control the game and play with the puck. We're having fun, so we'll just try to continue." Barkov and the Panthers will rest up before heading embarking on a four-game road trip, beginning with a swing through California starting Thursday against the San Jose Sharks (10:30 p.m. ET).